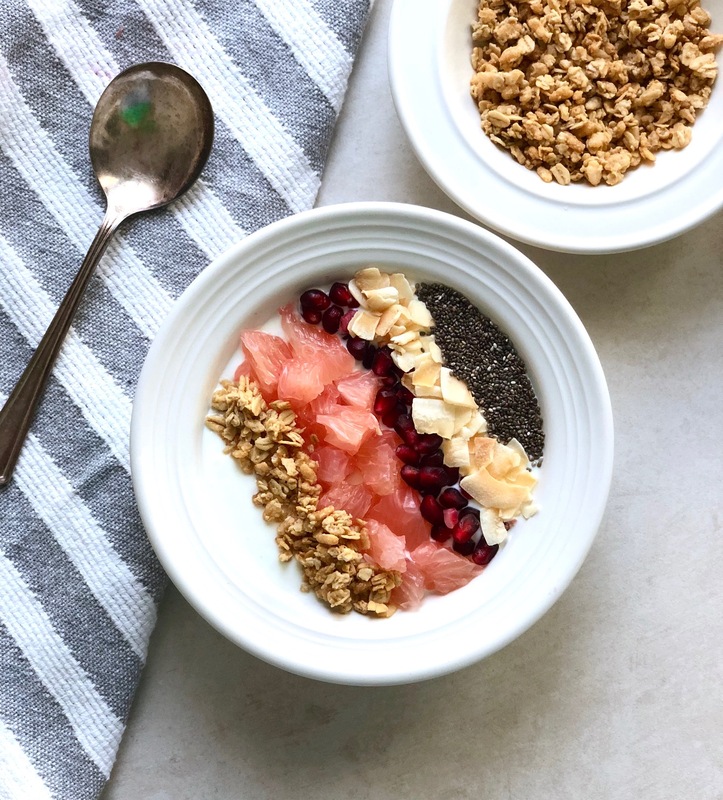 Keep your immune system flourishing and get your daily supply of vitamin C on those cold winter days with this amazingly delicious Greek Yogurt Breakfast Bowl. It is packed with high protein greek yogurt, chia seeds, yummy granola and nutrient dense pomelo and pomegranate winter fruit! If I am being completely honest, I’m not much of a yogurt person. It needs to be really delicious to entice me into eating a bowl of yogurt versus a nice warm breakfast like this HEIRLOOM TOMATO BOWL WITH GOAT CHEESE GRITS. But – boy did I hit the nail on the head with this healthy greek yogurt breakfast bowl! 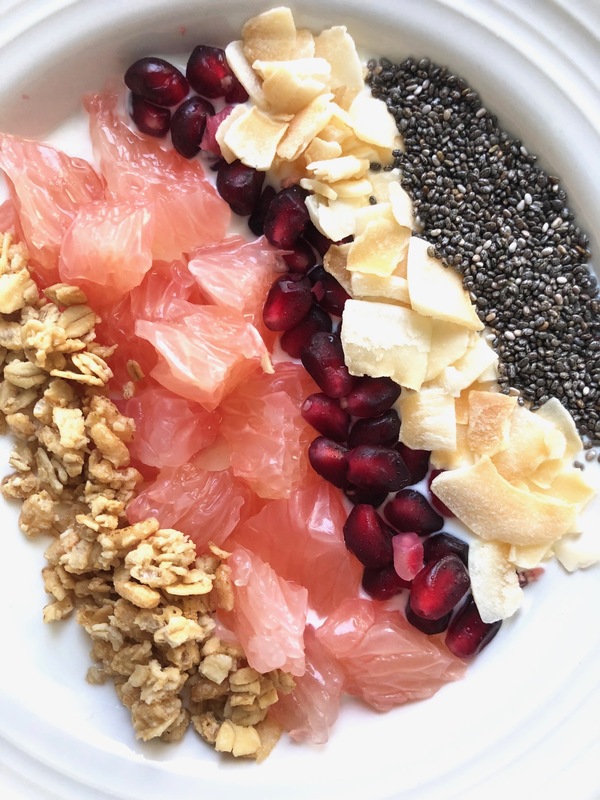 The sweet, tangy pomelo and pomegranate winter fruits pair perfectly with a crunch of fresh granola and chia seeds. I love adding a slight bit of coconut as well for a little tropical flair on those cold winter days (anyone else dream of the warm sun hitting your face on these frigid winter days?) If that wasn’t enough, you don’t even notice the protein-dense greek yogurt is the base of this delicious yogurt bowl after it is drizzled with a little DULCE DE LECHE caramel sauce. Ahhhh! I am getting hungry just thinking about it! Pomelos, also known as the pomello, pummelo, pommelo, Pamplemousse, jabong, or shaddock, are a unique citrus fruit that typically light green or yellow in color and primarily harvested in the winter months. Like a large grapefruit, they are becoming a more popular winter fruit, but don’t make an appearance as often as other citrus fruits because their plant takes 8 years to mature before it produces fruit. 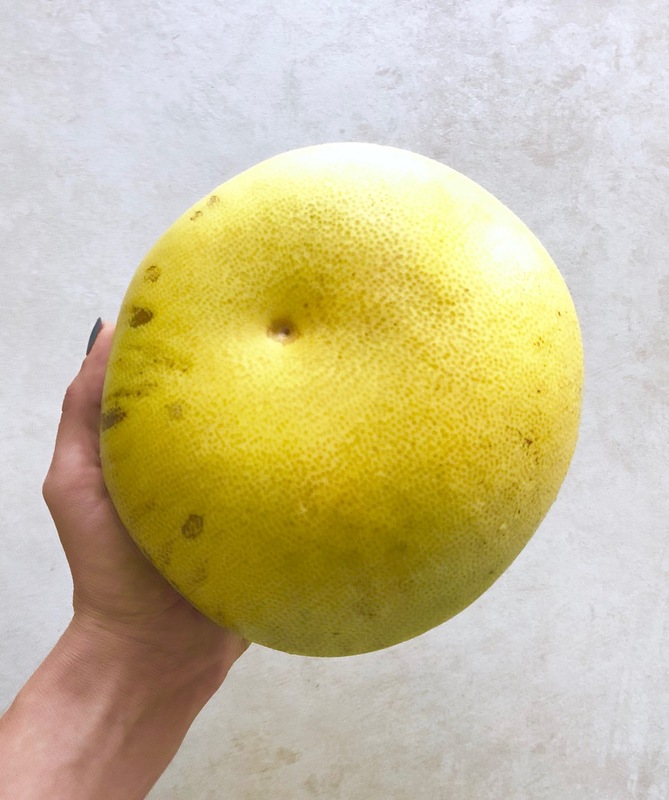 The pomelo has a thicker rind that most of its cousin winter fruits, making most of it disposable. However, once you get down to the delicious pink fruit, you’ll notice that it doesn’t quite have the same tart mouth puckering tang of a grapefruit. Instead, you’ll find a nice juicy, sweet flavor that is addicting! If you can eat an entire pomelo, it will contain 600% of your daily vitamin C and 25% fiber intake. It also has fat burning enzymes that can aid in weight loss that are not found in many fruits. Check out 7 Impressive Benefits of Pomelos for more info. If you like Citrus Fruit, you may also love this KIWI LIME SORBET or this VEGAN CHOCOLATE CAKE WITH CITRUS GLAZE! 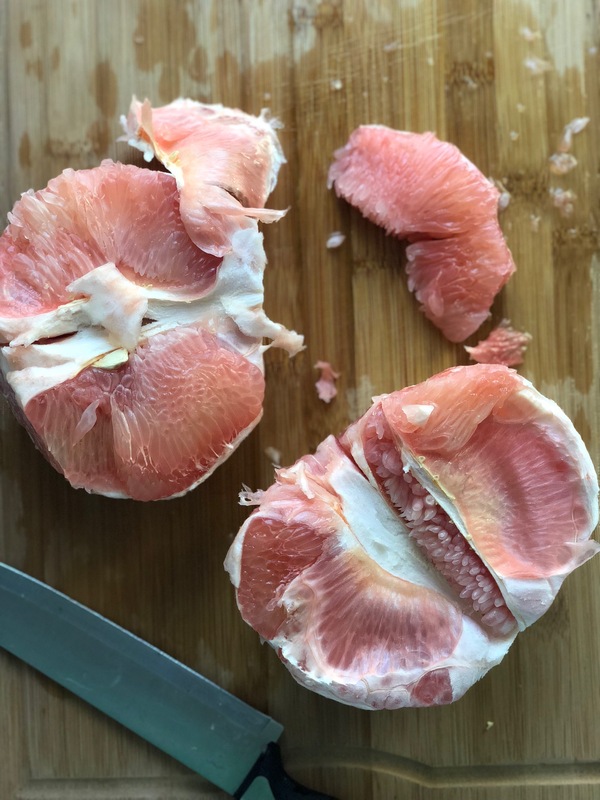 1) Slice the top off the Pomelo until you see the inner white pith. 2) Cut off the white portion of the fruit. 3) Separate the soft pink fruit from the hard white layer and cut into small pieces. 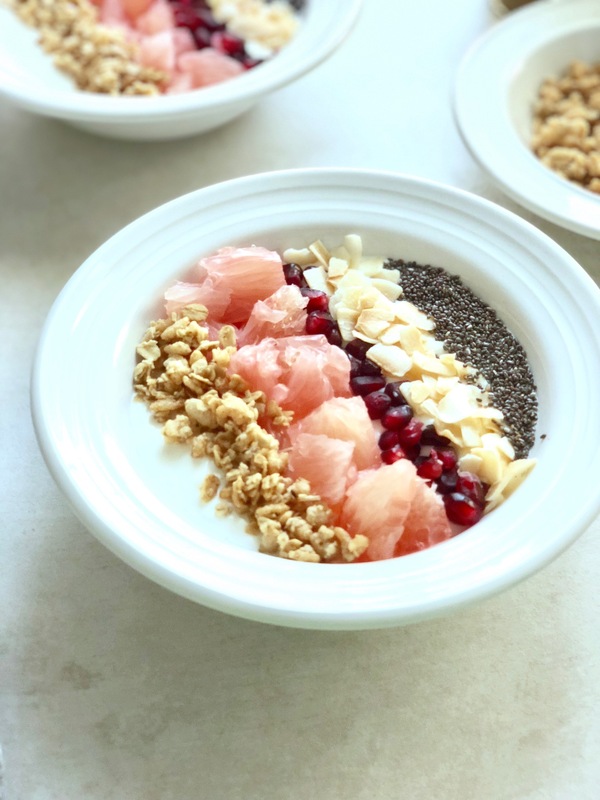 4) Place yogurt in a bowl and top with pomelo, pomegranate arils, granola, coconut chips, chia seeds and dulce de leche sauce (or maple syrup). Peel and slice pomolo. Remove pomegranate seeds from fruit. Divide yogurt among 4 bowls and divide ingredients in each one. Serve cold and enjoy! Can be turned into a vegan recipe with non-dairy yogurt! « 15 Healthy Desserts – Low Calorie and Ready in 5 minutes or less! Thanks Stacy! It’s really a nice light breakfast but is packed with flavor and nutrients! This looks really good! I’ve pinned it to my 21-day fix approved recipe board. Thanks Erin! I hope you enjoy it! Wow, that is the strangest looking fruit but once you cut inside it looks delicious! I really like the idea of a yogurt breakfast bowl.. so healthy! Thanks, Heather! It really is kind of intimidating! I wouldn’t have tried it if it hadn’t been for a friend introducing me. Now I can’t get enough and look forward to them being in season! I am absolutely loving that you include nutritional information. So great! Thanks Kerri! I am really trying to add that into my recipes if possible because I love it too and it’s so important if you are following a certain plan! Thanks Mandy! That caramel sauce is gold! This looks amazing! 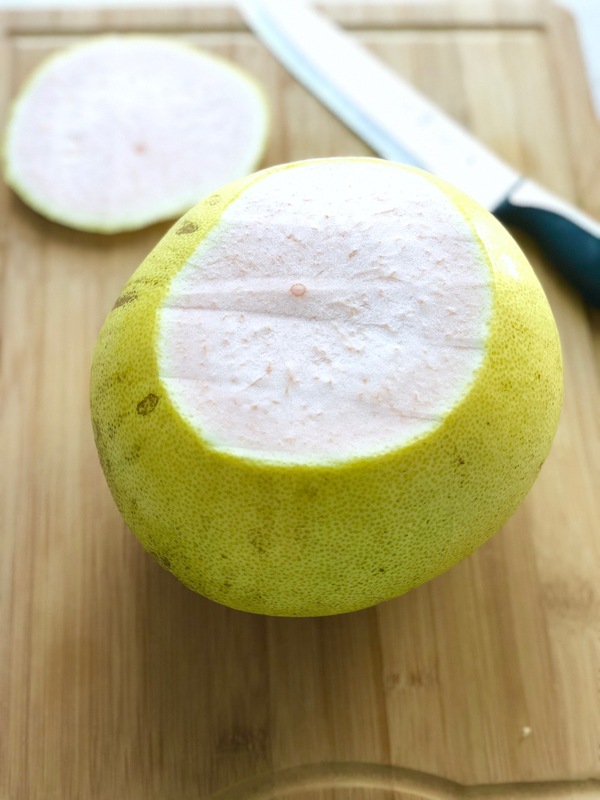 I’ve never had a pomelo before but I definitely want to try it now. Thanks for sharing! Thanks A! They are so addicting once you have tried them! That looks pretty bomb and I’m really interested in trying one of those Pomelos. I love grapefruit so I think this might be something for me! Thanks Mia! 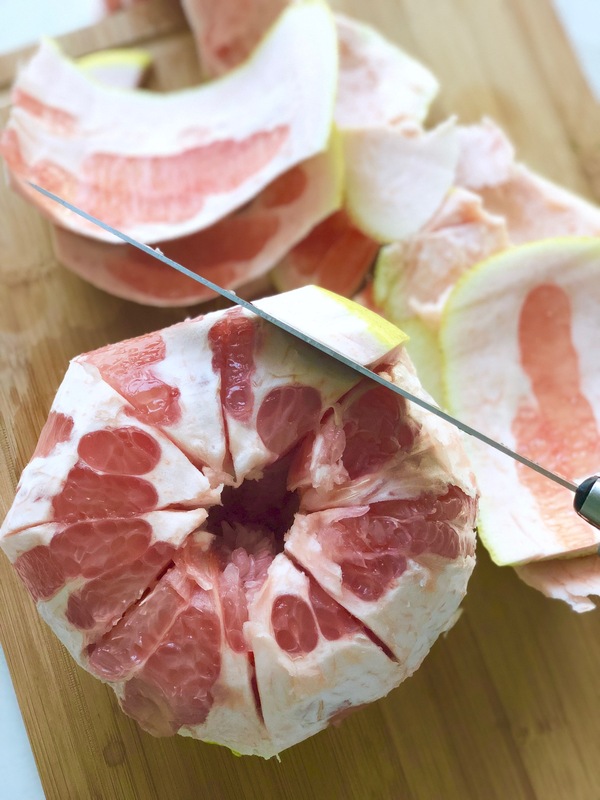 If you love grapefruit then you’ll be hooked on pomelos in no time! That fruit looks huge!!! I love yogurt parfait. It’s such a great way to make breakfast different every day. Looks healthy too.